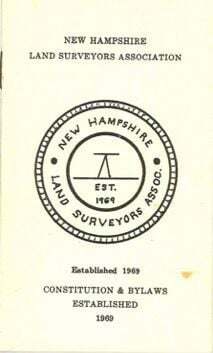 The New Hampshire Land Surveyors Association (NHLSA) was formed sometime in 1969 and turns 50 years old sometime in 2019. The birth date is unknown and interestingly is subject to some confusion or debate. The exact date as well as the where, why, how, and by who NHLSA formed seems to be a matter of opinion and amicable debate. One thing that is indisputable is that the very first annual convention and equipment show was held in December of 1970 and attended by 128 surveyors, engineers, architects, and guests. There was no equipment show in 1969 as the Association was still getting organized. Assembled here are some old NHLSA documents from the early days gathered from a plethora of different sources over the last couple of years. Included in the documents is a 1969 NHLSA membership roster with 74 names on it. There appears to be three 1969 NHLSA members that are still active in the Association today and a few others that are still members but who rarely attend meetings any more. From the 1969 Regulation of the Practice of Land Surveying by the State Board of Registration, forerunner to the Joint Board of Licensure, there were 128 Registered Land Surveyors listed. There were two entities and two different lists of surveyors running concurrently in 1969. One list was for registration as a land surveyor by the State of New Hampshire. The other list was for membership in NHLSA. You could be on one list and not the other or be on both lists. Both groups got off the ground in 1969. Gleaning information from a recently acquired archive, Mark Stevens, the current NHLSA Publications Director, was able to piece together the story or perhaps stories of the origin of NHLSA. Those documents sometimes contradict each other and sometimes seem to contradict the memories of our early members. Gaps occur in the written records and some meeting minutes are missing. The first TBM or Benchmark (the newsletters of the Associates) didn’t officially occur until November of 1973, and before that only nameless brief newsletters were sporadically sent out to members. So, with that as a disclaimer…..what really happened? The NHLSA formed for several reasons. In general, it was seen as the vehicle through which surveyors in this state would improve themselves both individually and collectively. In the early to mid-1960 pre-licensure days when anyone could hang out a shingle and offer land surveying services, surveyors were growing increasingly aware of the need to enforce higher standards and provide an avenue for recourse against sloppy practitioners. There was also an understanding that standards of practice needed to be upgraded to meet new demands and higher expectations from the real estate industry and the public in general. State licensing or registration was not unanimously desired, and profound differences over minimum surveying standards existed between engineers and foresters. These factors favored the formation of a voluntary association rather than a legislative mandatory State run organization. But how did NHLSA pop out into the world fully grown and hit the ground running in 1969? The answer seems to be hidden in some of the old documents and memories of early members. The interesting thing is that everyone seems to have a slightly different perspective or memory on the who, how, where, when and why it formed. Perhaps it shouldn’t be surprising that the perspectives are not only different, but the variations seem to be regional in nature. This perhaps makes sense in the days before internet and cell phones, cheap long distance calls, and development of high speed interstate highways. NHLSA got up and running in 1969 but like a baby learning to walk before they run there were earlier efforts to organize and also other associations that existed state-wide or regionally that served a similar function prior to 1969. Some of these organizations melded into NHLSA or contributed to the formation of NHLSA by providing membership lists, rules, minimum standards, ethics, or an organizational structure that could be learned from, borrowed, or duplicated. 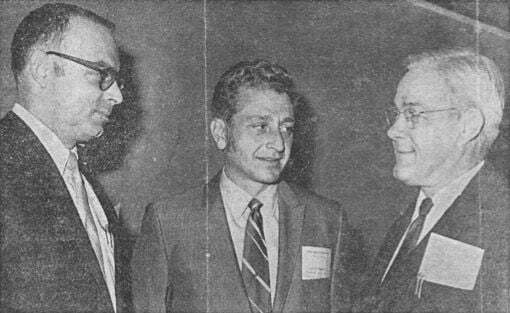 So while NHLSA may not have formed until 1969, at least as early as 1954 a statewide organization existed that provided an opportunity for surveyors to interact with each other for the betterment of both the individual and the profession. How would you like to be a scientist, or an adventurer, or a historian?